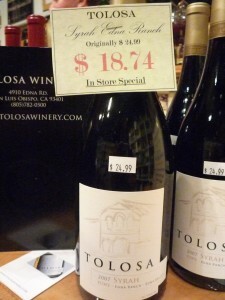 Last week I had the pleasure of tasting the line of wines from Tolosa Winery at Joe Saglimbeni's Fine Wine & Spirits Shop. And I felt good about it. Not just cause I am a lover of all things vinous, but also because this winery participates in very eco-friendly practices. Now I am not the most eco-conscious person out there, but like many of my fellow Millenial generationers, I like to do what I can to make an effort :) And drinking eco-friendly wine counts, right? Right. 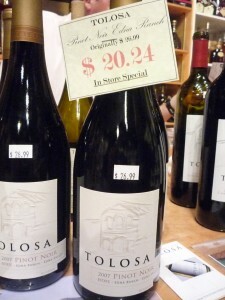 Last week I had the pleasure of tasting the line of wines from Tolosa Winery at Joe Saglimbeni’s Fine Wine & Spirits Shop. And I felt good about it. Not just cause I am a lover of all things vinous, but also because this winery participates in very eco-friendly practices. Now I am not the most eco-conscious person out there, but like many of my fellow Millenial generationers, I like to do what I can to make an effort :) And drinking eco-friendly wine counts, right? Right. Just let me have that one okay. So yes, back to Tolosa Winery and off my eco-friendly rationalizations :P Many moons ago (two hundred years worth to be exact) the friars at Mission San Luis Obispo de Tolosa began the first vineyards in the county in what is now the Edna Valley appellation. 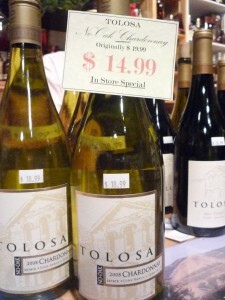 These early wines were highly valued throughout California and thus Tolosa Winery honors this tradition of crafting delicious wines in the Edna Valley. The Edna Valley appellation carries many similarities to the Burgundy region of France in that the valley has balanced hot days with cool nights, and soils that are a mixture of ancient sand dunes, limestone derived from its marine history, along with silt and clay. Thus, this region is great for growing the Burgundian varietals of Pinot Noir and Chardonnay. 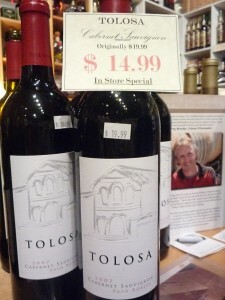 So how is Tolosa Winery eco-friendly? Well for starters they run off solar power which produces enough power to offset 90 to 95% of the winery’s electricity demand. Tolosa’s solar power system is expected to displace more than 32 million pounds of carbon dioxide (smog emissions) over the next 30 years, the equivalent to emissions of 2,600 cars from California’s roads. That’s pretty impressive. The list of their other eco-friendly practices can be found here, it’s worth a read! At the tasting I was able to try their Pinot Gris, Rose, Chardonnay, Pinot Noir, Cabernet Sauvignon, and Syrah. I was very impressed with the entire line I tasted with my favorites being the Rose, Pinot Noir and Syrah. 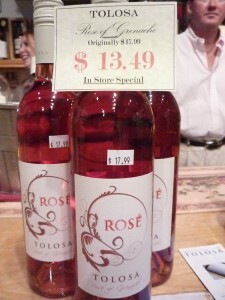 Instead of writing my own notes I have included the link to the Tolosa Winery tasting notes of each of the wines. I think this winery has done a respectable job on their website and one that is useful to both the consumer and the wine industry professional. They make it easy for people to understand their eco-efforts, their wines, their winery facts and philosophy. This is important because then people like you and me, and servers, sommeliers, and wine reps alike can thus talk about these wines with confidence and offer the kinda of positive word of mouth a winery like this deserves. And ya gotta love those prices on the wines! Alright, I’m off to get ready for this weeks Tuesday Wine Tasting at Joe Saglimbeni’s Fine Wine Shop … today’s theme is Greek wines!!! So excited to discover more of these delicious wines! Hope to see y’all Thursday for our Bastille Day Bash aka Our Debut “Social Wine Education” Event! Next Next post: Social Wine Education #1 – Bastille Day Bash!! 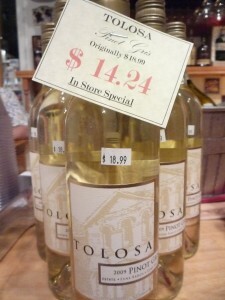 I love Tolosa Winery– so awesome that you featured it. 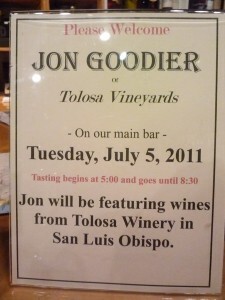 I’ve been to their tasting room in San Luis Obispo a few times and always buy a couple bottles. Their Pinot Noir is incredible. Awesome to hear!! I bet their place in fabulous! Miss you Kat! Thanks for the write-up Ceci Sipper! We’re so happy to hear that you enjoyed the wines and appreciate our efforts in sustainable practices. We hope you can come visit us in SLO, our tasting room doors are always open, cheers!